Description: Early town plan of Hrodna from the seminal work, 'Civitates orbis Terrarum'. Latin text of verso. Coloured. Description: RARE black and white figure map with illustrated borders including panoramas and costume vignettes. Part of lower margin repaired. Minor repair to lower centrefold. Description: Poland and Silesia. Published at the height of the Dutch Golden Age of map making, by two of its leading figures. Coloured. Description: John Speed's exquisite map of Poland embellished with miniature city views along the upper border and costumed figures on both sides. English text on verso. Strong impression. 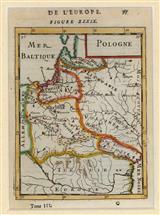 Description: Early map of Poland. Rare Michael Sparke edition with English descriptive text on verso. Coloured. Description: Hrodna. Bird's eye view of the city. References many buildings. Figures on horseback in foreground. Coloured. Description: The Empire of Poland shown with a southern coastline of the Black Sea and a northern coastline on the Baltic. F. Halma edition. Vivid original hand colour. Description: The Kingdom of Poland and the Grand Duchy of Lithuania. Lavish cartouche in top corner. Original colour. Description: Poland. Beautifully engraved map with elaborate cartouche. Strong impression. Description: Attractive map of Poland, Lithuania and the Ukraine in original colour. Description: Northern Souabe. Original colour. Description: Gdansk and environs. Inset panorama of the city. Superb original hand colour. Description: Kingdom of Poland. Large decorative cartouche. Original colour. Description: The Polish-Lithuanian Commonwealth before the First Partition. A military cartouche on the upper right is possibly a reference to the War of the Polish Succession or the First Silesian War. Original colour.